Twenty teams took part in the opening event of the new year at Park Avenue. 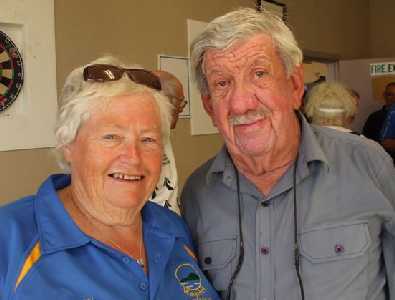 In the Trophy final, Fay Doyle and Harl Stevens defeated Kapiti clubmates and 2008 champions, Anne and Terry Dawson. Gwen Hill has advised that Steve Frampton, Jack Gazzard, Bob McCarthy, Ralph Priddle and Bryan Wells have all been confirmed as Regional level Umpires following the training course and practical examinations run by National Umpire, Christine Taylor. The Director Player Development, Director - Representation and the members of the Representative selection panels have not yet been announced. The final results from the National Senior Doubles played in Christchurch last month are now available. 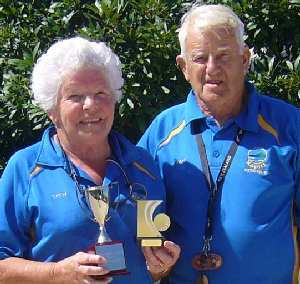 Kapiti club members continue to take the major tournament spoils this year with Kath and Kaye Alison winning the Khandallah Mixed Doubles. 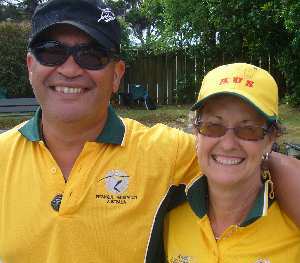 In the final, they beat the Wanganui East pairing of Yvonne Futcher and Tony Simpson. Down 9-10, they collected one point to tie the match at the conclusion of the 75 minute time allocation and then won the golden end to take the title. Please find attached a notice outlining changes to the rules of pétanque made by the FIPJP recently. The changes were ratified by the PNZ Board at its meeting in November 2010 and came into effect on 1 January 2011. In summary, Maurice Belz and Sharon Cannon beat Joan Miller and Claire Wilson 13-9 in the Trophy final. The Plate was won by Keith Dixon and Christine Taylor from Shirley MacDonald and Barbara Nicholls. The Bowl was won by Mark Richardson and Karen Stephen ahead of Krissy Denniss and Brian Futcher. Nine of the twelve WPA clubs have entered the 2011 WPA Inter-club competition which starts on Saturday 29 January. Twenty-four teams took part in the Open Triples and fourteen in the Women's Doubles. This was quite a drop from last year's 41 and 20 respectively. In the Triples, Francis Ching, Yann Nauta (Tahiti) and Georgio Vakauta (NZ) retained their 2010 title beating Luciano Paint Koui, Hoitara Siaduchin and Robert Tung (Tahiti) 13-8. In the Women's Doubles final, Helene Arai and Rita U (Tahiti) beat Tumata Pere and Mariane Wong (Tahiti).